Simplify some of your preparation for the Advent Season. 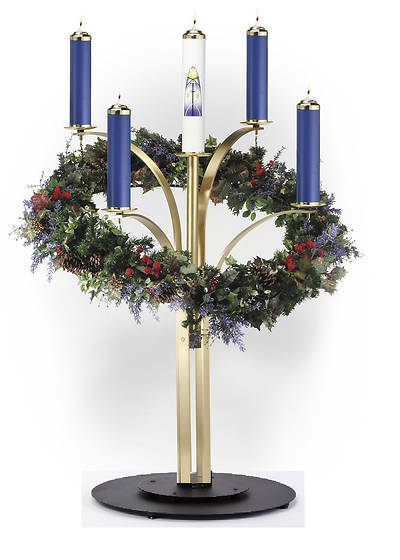 Decorating with greenery is easy with this striking Contemporary Advent Wreath featuring satin solid brass arms and a large 34" ring; the decorated ring gives the look of being suspended in air. Each candleholder arm has levelers to insure the candles are vertical, and the base has levelers to insure that it stays level. Each piece is powder coated steel for superb durability. Candle sockets are 1-1/2". Wreath comes with hanging platform for Christ Candle and foliage which can also be removed; Wreath is 48” H, and weighs 75 lbs. Greenery and Candles not included.